Africa is one of my favorite continents to visit for many reasons including its natural beauty and amazing wildlife viewing opportunities. Going on safari in Africa is at the top of many travel bucket lists and rightly so but there are more incredible things to see and do in Africa. 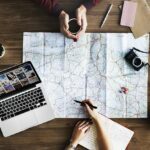 To get you started I’ve created this epic guide containing 50+ of the best African adventures, experiences, things to do and places to visit which are perfect for any Africa Bucket List. Some of these are places I have visited and things I have experienced myself and the rest are places, experiences and adventures that I have researched and added to my personal Africa bucket list. 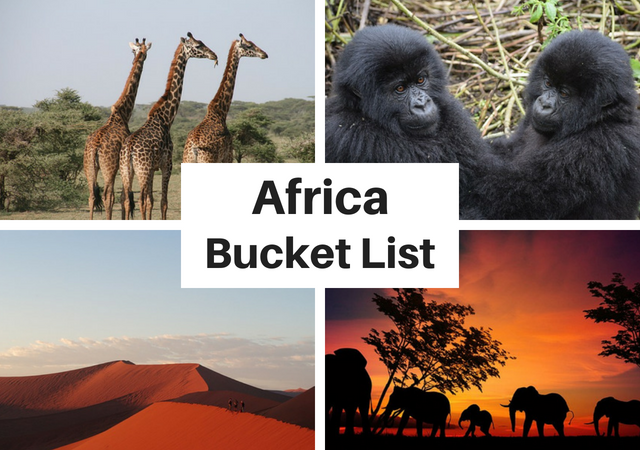 These are my top 5 things to do in Africa and are on the very top of my Africa bucket list. You can’t visit Africa and not do a safari. There are parks in several countries where you can go on safari. 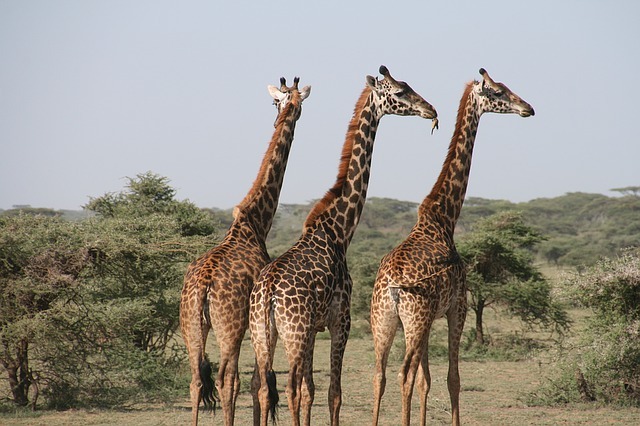 Some of the best and well known safari destinations include Kruger National Park in South Africa, Masai Mara in Kenya, the Serengeti in Tanzania, Etosha National Park in Namibia and Chobe in Botswana but there are many more places to view wildlife. Even if you are short on time, you can even do a safari for a day. You can book a day tour to Kruger National Park from Johannesburg or you can book a one day safari to Chobe from Victoria Falls or Livingstone, Zambia. Every year during June to September, thousands of wildebeest and zebras cross over from Masai Mara, Kenya to the Serengeti, Tanzania. You can even see the migration from a sunrise hot air balloon ride above Serengeti National Park. There are less than 1,000 endangered mountain gorillas left in the world and you can only see them in the wild in 3 countries in Africa. 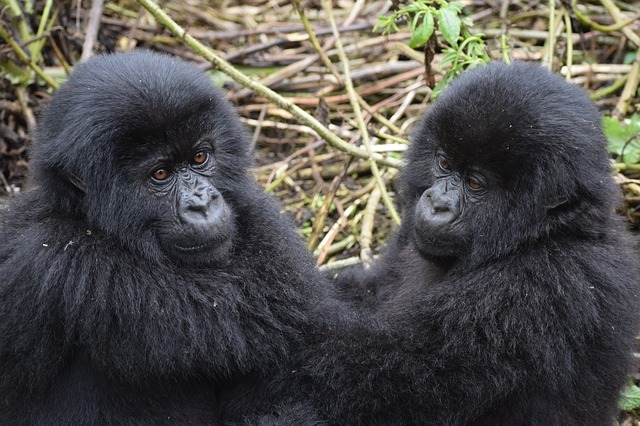 You need a gorilla permit in order to trek gorillas and it is not cheap. Rwanda is the most expensive at $1,500 per person while the cost for a permit in Uganda is $600. Trekking in the Democratic Republic of the Congo was the most affordable at $400 but Virunga National Park is currently closed to tourists until 2019. How would you like to eat breakfast with giraffes? Giraffe Manor is a bucket list worthy hotel located right outside of Nairobi where guests can feed the resident Rothschild giraffes that poke their long necks through the windows during breakfast. Staying at Giraffe Manor is pricey so if your budget does not allow you to stay here, you can still get close to and feed giraffes at the nearby Giraffe Centre. One of the best places to visit in Africa is Mosi-oa-Tunya – the local name for Victoria Falls which means the smoke that thunders. You can see Victoria Falls from either Zambia or Zimbabwe but if possible try to visit from both sides. If you enjoy adventure, you will find tons of adventure activities in the area including bungee jumping and whitewater rafting on the lower Zambezi River. 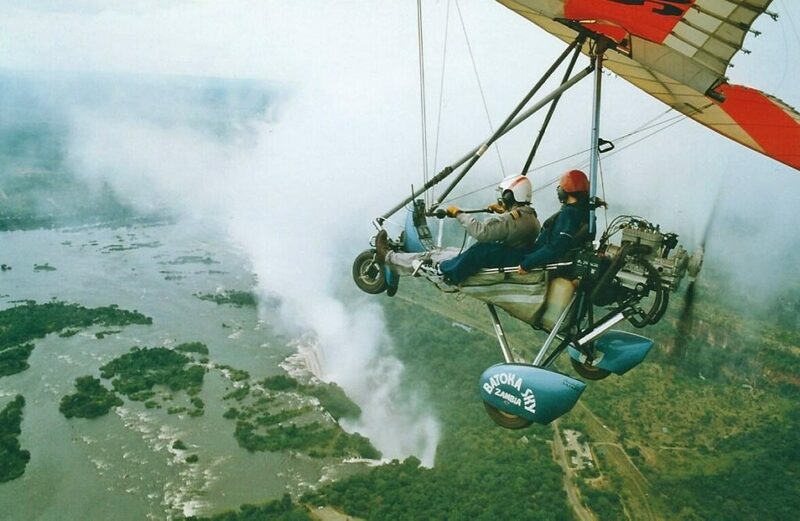 You can also take a microlight flight over Victoria Falls to see the falls from above. During certain times of the year, you can even swim in the Devil’s Pool in the falls. 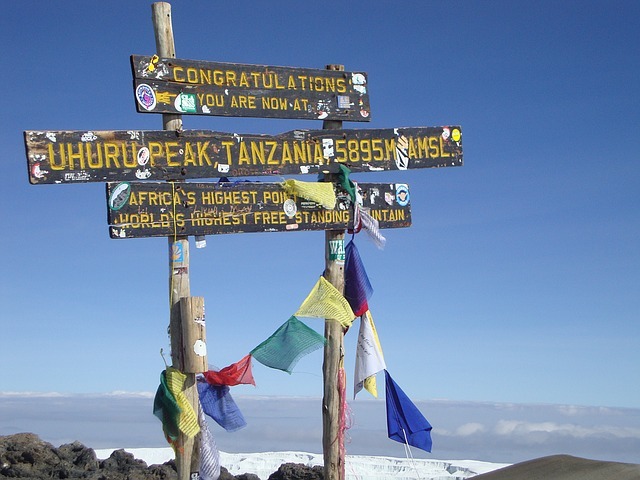 Climb Mount Kilimanjaro, the highest mountain in Africa. Go sandboarding on the dunes of Namibia. Go grade 5 white water rafting on the Nile River at Jinja, Uganda. Bungee jump off the Bloukrans Bridge, the highest bungee from a bridge in the world. Go cage diving with great white sharks in South Africa. You can book a day tour from Cape Town. Swim with manta rays and whale sharks or go scuba diving at Tofo, Mozambique. The red-sand dunes of Sossusvlei in Namibia. 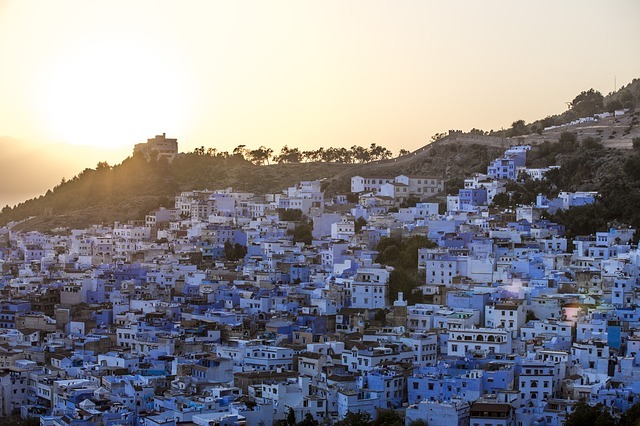 Chefchaouen, known as Morocco’s blue city because of the blue-washed buildings of its old town. You can visit on a day tour from Fez, from Tanzier or from Rabat. Rock-Hewn Churches of Lalibela in Ethiopia. The colorful Danakil Depression in Ethiopia. Seven Coloured Earths in Mauritius, sand dunes of seven distinct colours. 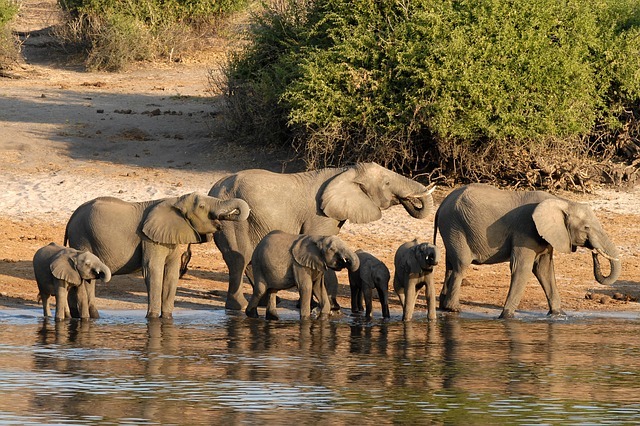 See hundreds of elephants at Chobe National Park. You can visit Chobe on a day trip from Victoria Falls. See elephants and hippos from a traditional dugout wooden canoe (mokoro) at the Okavango Delta, Botswana. Visit Makgadikgadi Pans in Botswana, one of the largest salt flats in the world. See wildlife at Etosha National Park in Namibia. Not only can you spot wildlife during drives but you can see animals around the waterholes from your camp. Kolmanskop, a ghost town in the Namib in southern Namibia. Spitzkoppe, a group of bald granite peaks in Namibia. The beautiful Drakensberg Mountains in South Africa and Lesotho. Lake Abbe in Djibouti, a salt lake covered with steaming tall limestone chimneys. Go on a walking safari in South Luangwa National Park, Zambia. This park is famous for its large leopard population and is one of the most affordable places for a safari. Go swimming or snorkeling in Lake Malawi, the third largest lake in Africa. Relax at Le Digue in the Seychelles which is known for the large granite rocks on the beach. Enjoy the beautiful sand bars and white sands at Vilanculos, Mozambique. See the spectacular Kalandula Waterfalls in Angola, one of the largest waterfalls in Africa. Sleep in the underwater room at The Manta Resort in Pemba Island, Zanzibar. See the Agadez Grand Mosque, a mosque built of clay in Niger. Visit Djenne in Mali, famous for its buildings made from mud. 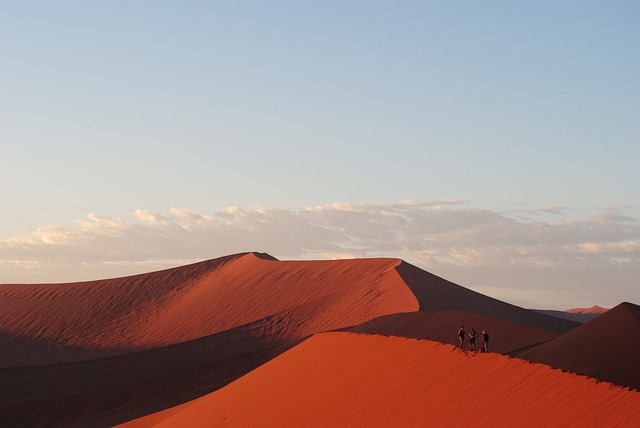 Go on a desert safari at the Sahara Desert in Morocco. Stay in a riad (traditional Moroccan house or palace with an interior garden or courtyard) in Morocco. Float in Lake Assal, a stunning lake in Djibouti that is saltier than the Dead Sea. See the penguins in Boulder’s Beach, South Africa. Hike or take the cable car to the top of Table Mountain, the most iconic landmark in Cape Town. Drive the Garden Route in South Africa. Drink wine in the Cape Winelands in South Africa. Two of the most popular regions are Stellenbosch or Franschhoek and they can be reached in only an hour from Cape Town. Go trekking to see the endangered Golden Monkeys in the Virungas. Go chimpanzee tracking in Uganda. Hike to the top Mount Nyiragongo in the DRC, an active volcano home to the largest lava lake in the world. See thousands of pink flamingos at Lake Bogoria. Learn about about African slavery at Cape Coast Castle, Ghana. Do a walking safari next to elephants at Mole National Park in Ghana. See Laas Geel, rock paintings in Somaliland. Walk along Avenue of the Baobabs in Madagascar. 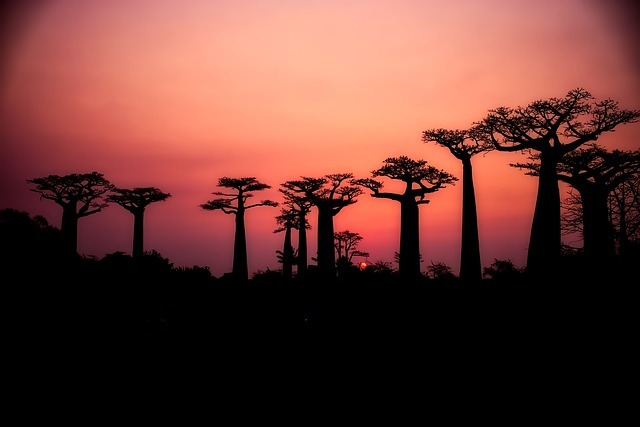 This group of baobab trees lines the dirt road between Morondava and Belon’i Tsiribihina in the Menabe region of western Madagascar and is most photogenic at sunset and sunrise. So there you have it – the ultimate Africa bucket list. If there is an experience or place you think I should include please let me know in the comments below! 10 Hotels That Should Be on Your Bucket List! 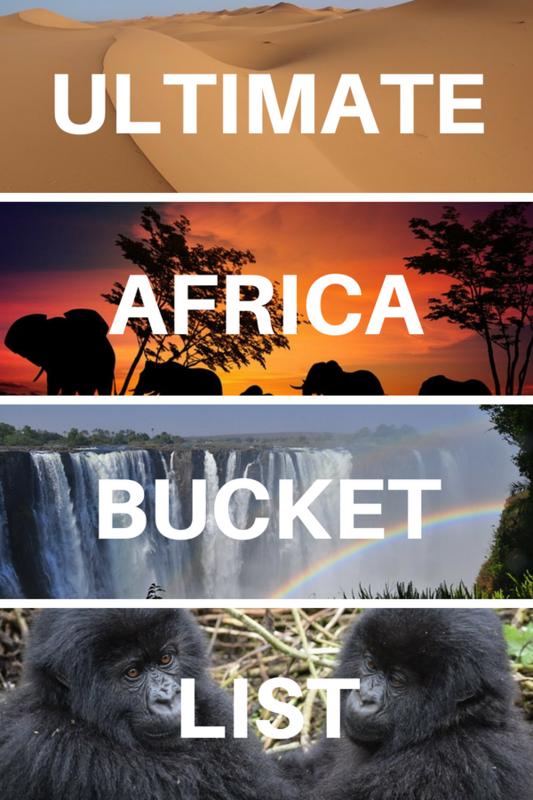 Many of those things are on my Africa bucket list. I like that most of them combine a bit of adventure with nature. I have always wanted to sleep in an underwater room like at The Manta Resort in Pemba Island, Zanzibar! This is awesome! I can tick off a few experiences in South Africa, Madagascar and Mauritius but top of my list to do at the moment are Sossuvlei, Lake Victoria, and the Rift Valley in Malawi. 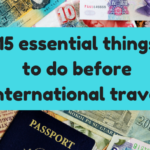 I have been to Kenya only but the other things you mentioned here are on my list too. Next I am really looking forward to trek with the gorillas. Also seeing the chimpanzees in Uganda and getting lost in the Sahara desert of Morocco. So many things to do! So many places to visit! The mokoro experience in Botswana sounds like something that would top my list on a trip to Africa. This is an amazing compilation of travel ideas for a massive continent so thank you for sharing!